Cedar Springs features multiple event spaces and general facilities that are perfect for large or small groups. Throughout the year, we host conferences, retreats, camps, weddings, family reunions, training weekends for high school/college teams, and more! We work closely with each of our customers to ensure that our facilities and set-up perfectly fit your needs. Let us handle all the logistical details so you can enjoy your event with your group. Below, we have pictures and information about each of our spaces. Take a look and then contact us for rates and reservations. Keep scrolling for information about our lodging as well! 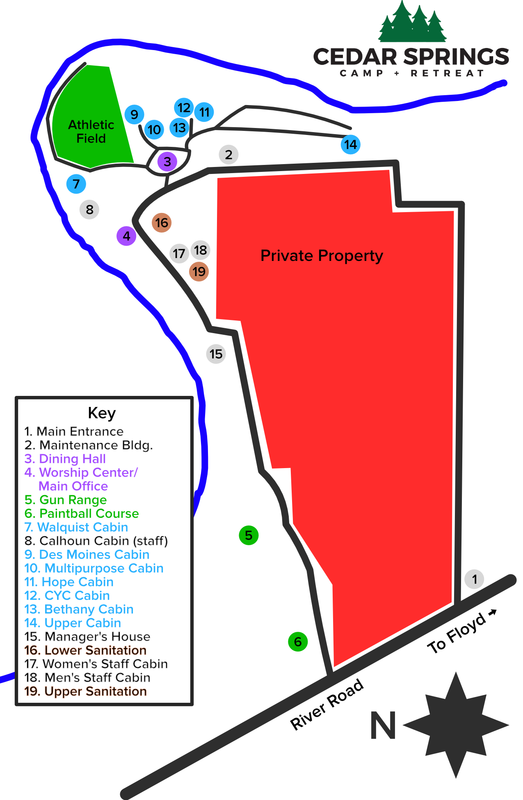 For a layout of the grounds see our map. Recently renovated, the Worship Center is our largest building on site. Features large stage, full sound system, lights, and customizable seating (seating for up to 350). It's perfect for large conferences, retreats, or weddings, and the space can also be cleared for indoor games like dodgeball or 9 Square in the Air. The Worship Center also houses our Snack Shack, a kitchenette space, and restrooms. Our Dining Hall features an industrial kitchen and a trained kitchen staff that can provide delicious meal options for up to 170 people per setting. Our dining options are highly customizable, depending on your group's dietary needs and schedule. Please contact us today for quotes or more information! Cedar Springs has a number of indoor and outdoor meeting spaces for your small groups or breakout groups at a large retreat/camp. Crane Chapel (pictured) is one of our outdoor meeting areas, and we also have an abundance of smaller rooms on site that provide an intimate setting for groups of 5-50. Contact us today to discuss which options will make sense for your event. Here at Cedar Springs, we believe that a comfortable and relaxing place to sleep is foundational to your time with us. We know that well-rested campers are happy campers that are better able to commune with God and each other! We offer a variety of options as luxurious as hotel rooms and as simple as cabins or dorm rooms. We also offer a variety of camping spots that provide water and electric, along with a number of full hook-ups that provide sewer as well. Below is a list of each lodging option. Please contact us today for rates and reservations. Cedar Springs has 7 cabins on site, equipped with bunk beds and full bathrooms. Amenities vary with each specific cabin - some feature extra meeting spaces, full kitchens, multiple floors, etc. - so please contact us today to discuss which option will work best for you and your group. The Upper Cabin is one of our best lodging experiences! Built on top of a hill overlooking the Cedar River and Cedar Springs itself (yes, the spring that feeds into the river is situated right below the cabin! ), the Upper Cabin offers an unparalleled view in a secluded part of the camp. This cabin is situated deep in our 117 acres, and is perfect for a private getaway or relaxing retreat into nature. Features a queen bed, two single beds, a queen pull-out couch, full kitchen, fireplace, full bathroom, and deck area. Contact us today for rates and reservations! Cedar Springs has three hotel rooms - the Americana suite (pictured), the Queen Suite, and the Wilderness suite - available if you are looking for a luxurious, intimate space for your stay with us. Each room features a comfortable queen bed, couch, chair, a full bathroom, coffee maker, microwave, and a mini frig. Contact us today to book your relaxing weekend trip! Cedar Springs features a large campground area with spaces for tents, campers, and/or RVs. We have a variety of spaces with water hookups and multiple spaces with full sewage hookups as well. Our grounds include two shower houses for your convenience. Contact us today to plan your weekend at Cedar Springs!